Runway 13 at Hong Kong’s Kai Tak Airport (closed in 1998 and replaced by the current airport at Chek Lap Kok) had a hideously difficult approach in which pilots would fly in from the west, following an instrument guidance system (IGS)1 to the approach’s middle marker (also helpfully marked by a giant checkerboard painted on a hillside, which, if not spotted in time, required a missed approach), and then immediately hand-fly a steep right turn2 at very low altitude directly over the heart of Kowloon City to line up, seconds before landing, with the runway, using only the Mk. I eyeball for guidance, with no room at all for error. For obvious reasons, only the best of the best pilots were allowed to shoot the bent approach to runway 13, and only after extensive simulator training for that specific approach, and even they had considerable trouble with it, even in good weather. The bent approach was necessitated by the presence of an inconsiderately-placed mountain in what would otherwise have been the runway 13 approach path, which, for a straight-in approach, would have forced the use of a glideslope too steep for a widebody jetliner to safely fly. Not all aircraft (or even all airliners) are widebody jets, though, and smaller, higher-performance aircraft (including virtually all STOL aircraft) can frequently shoot approaches much (much) steeper than what would be safe for a 747 or A330. Given the difficulty and hazard of the standard bent approach, did Kai Tak have a straight-in approach to runway 13 for use by steep-approach-certified aircraft? 1: Like an ILS, except that following the IGS all the way down would kill you. 2: I don’t know if the Kai Tak checkerboard turn would technically qualify as a pylon turn, but it must surely have come close! did Kai Tak have a straight-in approach to runway 13 for use by steep-approach-certified aircraft? 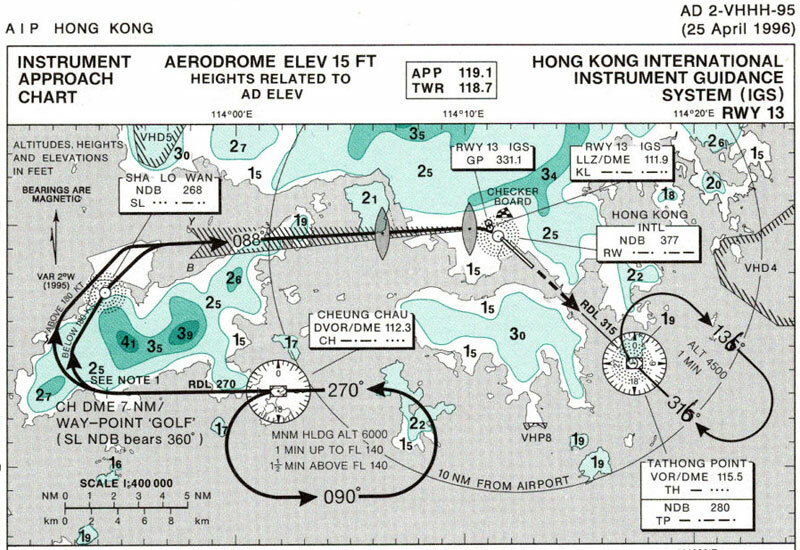 During the 1990s I regularly flew the Hong Kong IGS approach in 747s. At that time, to the best of my knowledge, there was no straight-in approach to runway 13.
only the best of the best pilots were allowed to shoot the bent approach to runway 13, and only after extensive simulator training for that specific approach, and even they had considerable trouble with it, even in good weather. While the above might have been true for some carriers, it was not true (Wikipedia to the contrary) for the two 747 carriers I worked for. Cathay Pacific might have had some such requirement as that was their home base. Go to https://terryliittschwager.com/talking-of-flying.php#kaitak for an account of my first time in. Wikipedia has another error or at least a poor choice of words IMHO when they say that upon reaching the checkerboard hill you started the turn toward the runway. if you look at the approach plate, you'll see the turn starts well before the checkerboard. The rule was that you had to have the checkerboard in sight ahead before starting the turn. If you didn't it was missed approach time. Fortunately I never had to do that. I never considered the approach dangerous. Challenging, yes, but not dangerous. And I'm really not a masochist or at least I didn't think of myself as such. After you got used to it, it was fun! Not the answer you're looking for? Browse other questions tagged aviation-history approach airport-operations or ask your own question. What is the role of a flight control computer during a steep approach?